In a normal budget process Congress allocates funds for the following fiscal year by 30th September or else it enacts a continuing funding resolution. But if Congress can’t agree on any of the processes, it forces a shutdown. A government shutdown happens when non-essential or optional federal programs close because Congress fails to fund them appropriately due to any reason. Because 5 billion dollars bill was not included in the budget to build the wall on the Mexico border and the Democrats and Republicans could not come to the conclusion the government shutdown was forced. On 21st December 2018, the government shutdown was a fact and became the longest shutdown in the history of U.S. Apply online from the comfort of your home and get your U.S. ESTA Authorization by email! TSA- Transportation Security Administration is in charge of protecting the national transportation systems and ensuring the freedom of movement of people and their safety. Millions of passengers get screened by TSA every day as they pass through the security checkpoints at the airports. However, the Government deadlock is impacting the operations of TSA and its employees. The reasons behind the queues and disruptions are the result of TSA staffing issues. Due to the Government shutdown, and the impossibility of paying their stuff, many TSA agents chose to quit. Airports are fully functional but with no proper TSA staff so the wait time at the airports is constantly increasing. 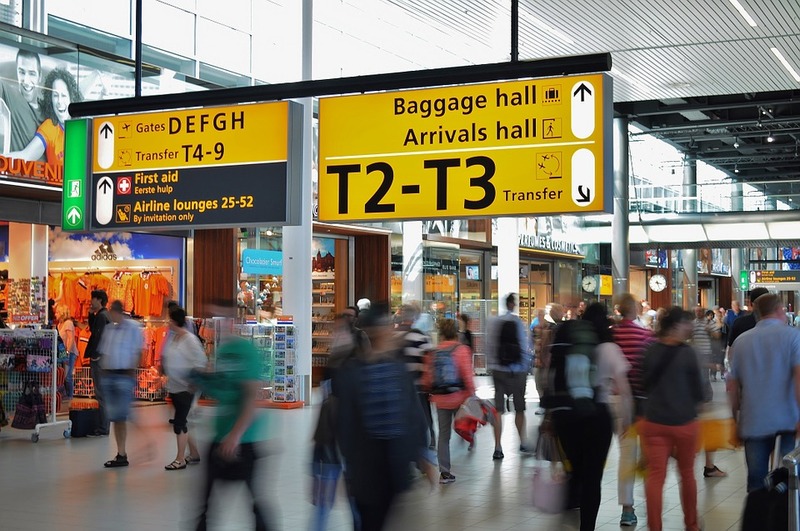 Airport Waiting Time is a major concern not only for the passengers but also for the airport security and immigration officials. Still, TSA agents are working round the clock to handle all that extra workload and yet they are friendly and upbeat to the travellers. TSA was already forced to close some of the screening lanes at some airports. Now, with limited people force, security is the major concern. During the shutdown many other facilities were affected too, among which the state funded museums. Visitors were either redirected or left alone without medical or other support in the U.S. National parks. A lot of state workers had to quit and some are running out of funds. Major concerns are the order and security at the national airports. It is now common to see long queues before the security screening. The government shutdown has only intensified those long queues and added to the woes of the harried travellers. Many airports are getting disrupted because of the government deadlock. So far, the queues on the Newark Airport seem to be the longest before the security screening. The Miami International and Houston George Bush airports have already closed one of their terminals making the wait times growing. Not sure if your passport is eligible for the Visa Waiver program? Check the requirements here. Usually, the average wait time at US airports is about 15 minutes. However, ever since the Government shutdown, the wait times have escalated. The waiting time at the busiest airport in the world, Hartsfield-Jackson Atlanta International Airport has stretched to almost 90 minutes at the checkpoint. As for other major airports, the wait times varied but were about 15 minutes to 30 minutes. The maximum wait times were seen in Miami, Tampa, Huston, and Honolulu at about half an hour. Atlanta airport saw almost an hour and a half of wait time since the government shutdown began. Many airports are now urging their passengers to arrive early. Get you ESTA Visa within 3 easy steps. Most passengers are getting anxious about the long wait time and want to know about the average wait time on the specific day they’re traveling. As most airports don’t publish the wait times on their websites, passengers can rely on MyTSA app to get this information. TSA recommends that the travellers should download and use the official app to get an estimate on security wait times at all national airports. However, one must take into account that regarding the time spent at the queues, the information on MyTSA is based on passengers’ witnesses and their experience at the queues and therefore, it can be kind of misleading, and yet it gives an idea on the general wait time. Some of the U.S. airports’ websites are also publishing the estimated wait time. See also: What to Choose – A Visa Or An Online Travel Permit ESTA? MyTSA app provides access to the airport security 24/7. Among the information provided one can check the items banned for boarding. It also shows how to wrap and prepare the items before boarding. Waiting time, delays as well as weather conditions at different airports can also be checked. One can also get a general idea on how busy a particular airport is likely to be on a specific day and time of travel. TSA live assistance is also offered in order to get ready for the security checkpoint.